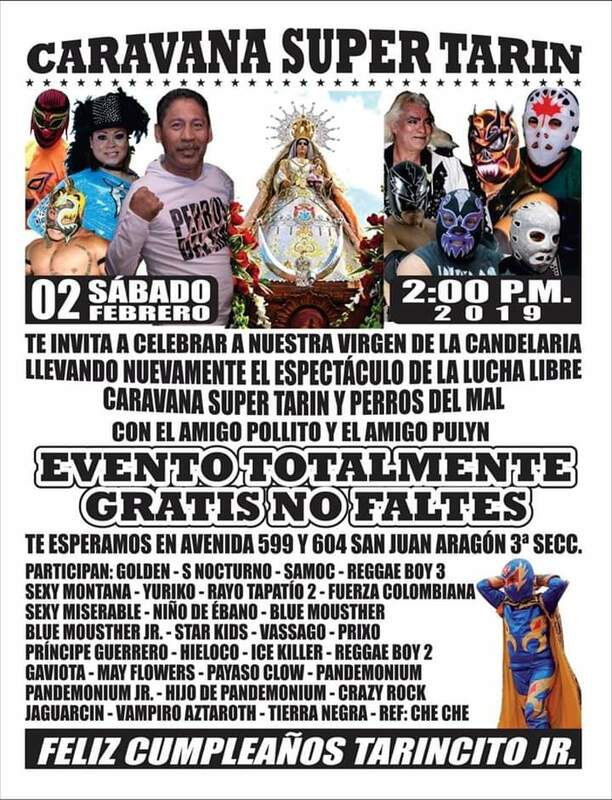 Straight falls. 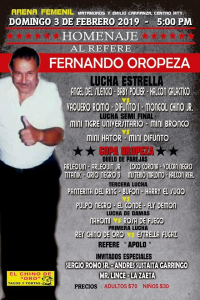 First by excessive violence DQ. 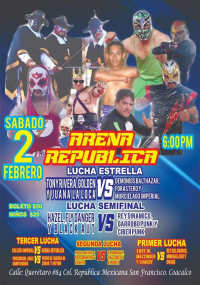 Second hurried after Flyer suffered a leg injury. 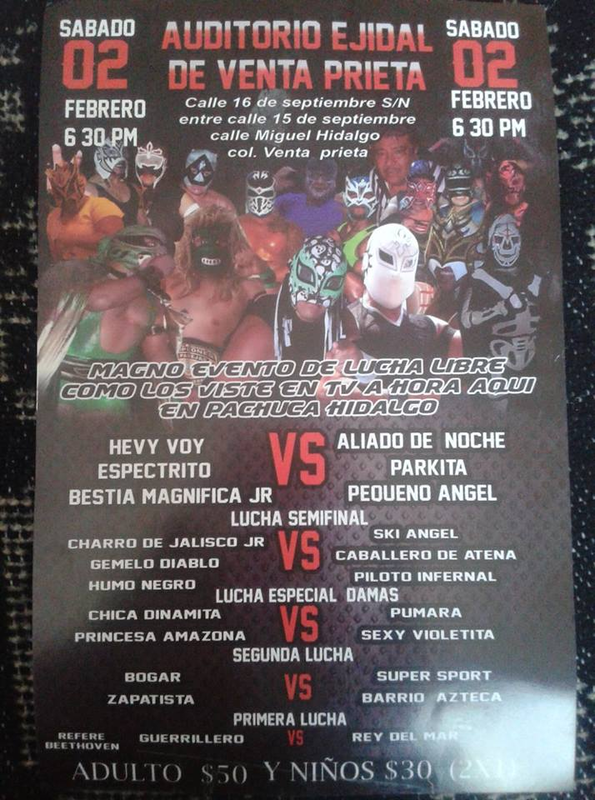 10:06. 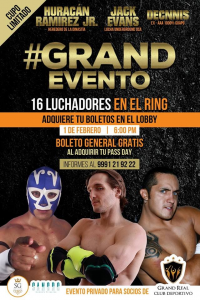 Terrible blocked a bodyscissors cradle and hooked a rope to get the win. 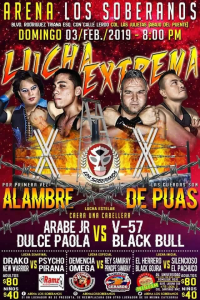 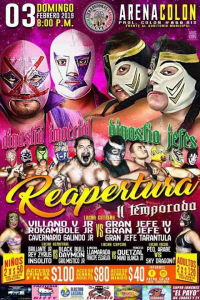 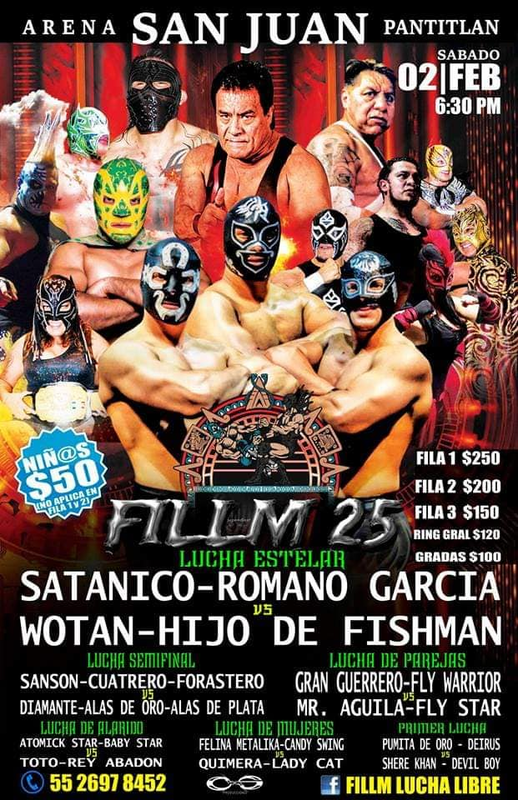 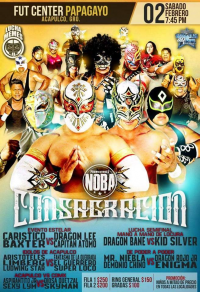 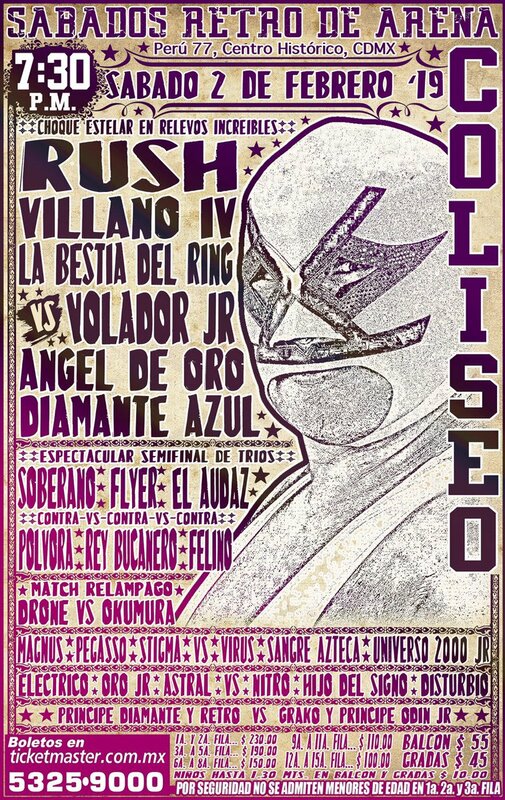 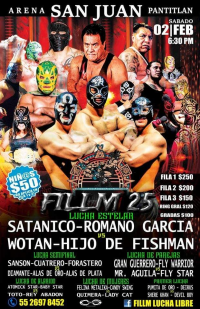 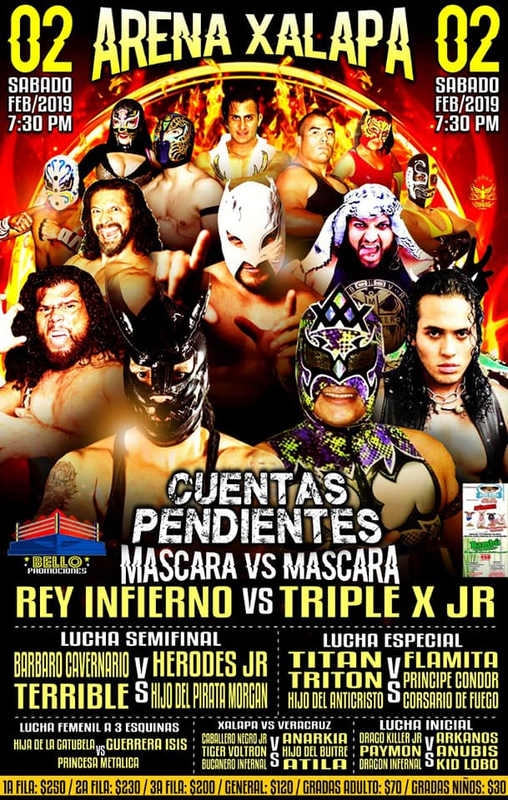 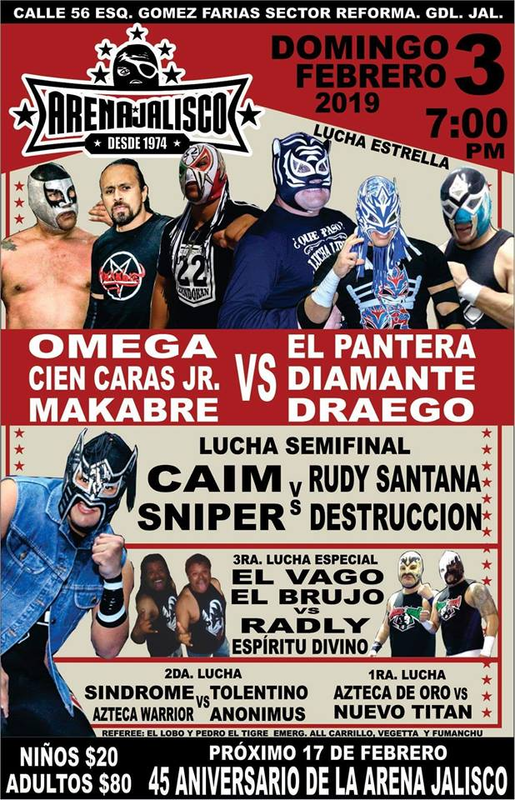 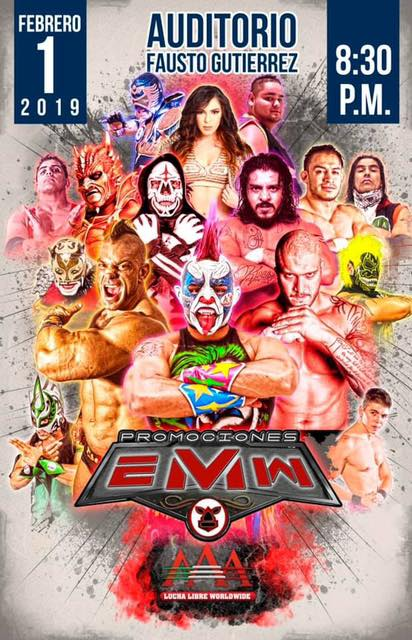 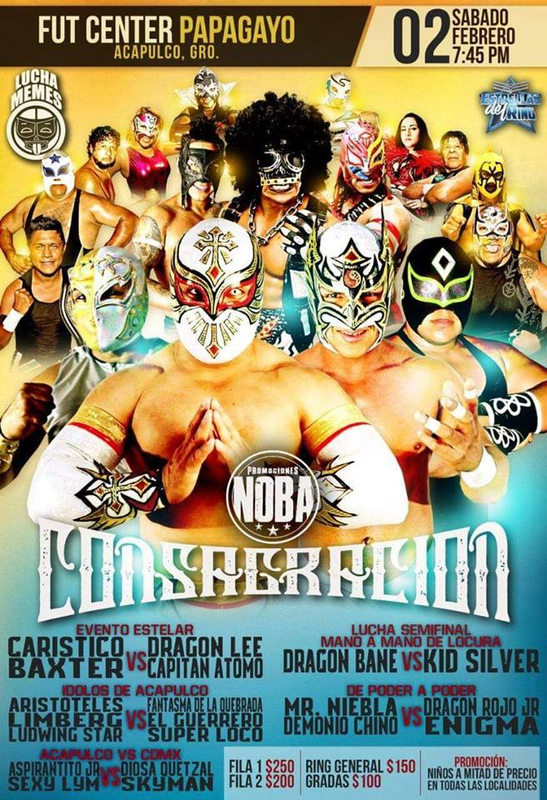 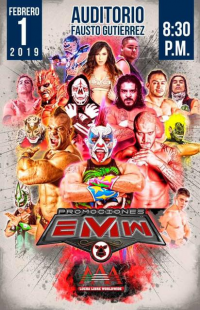 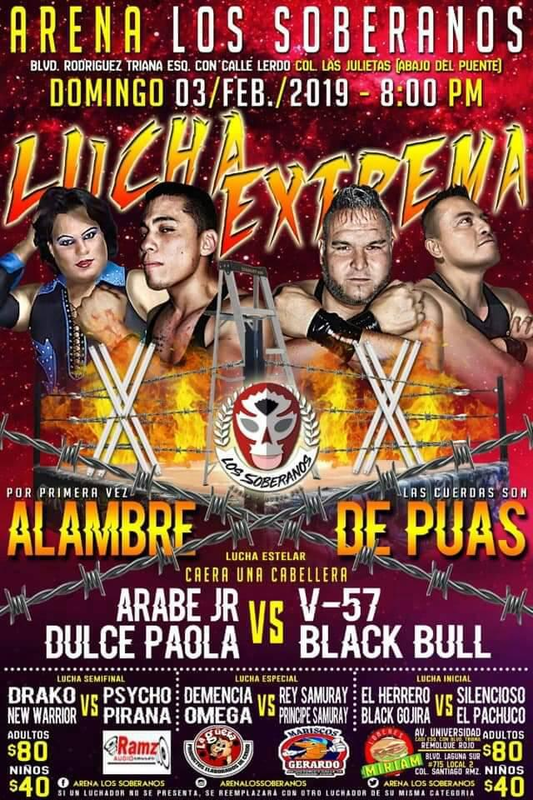 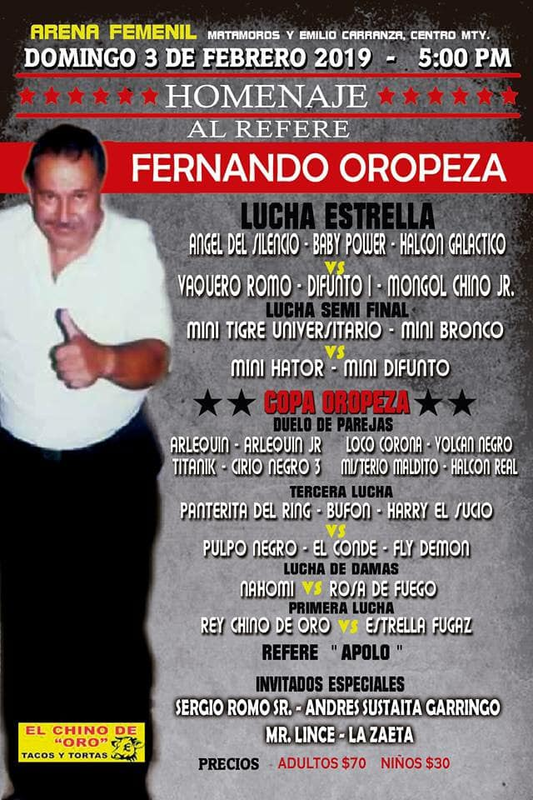 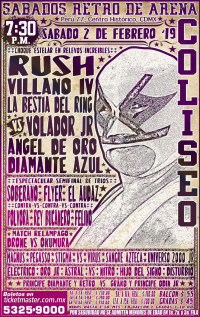 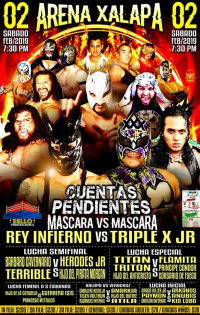 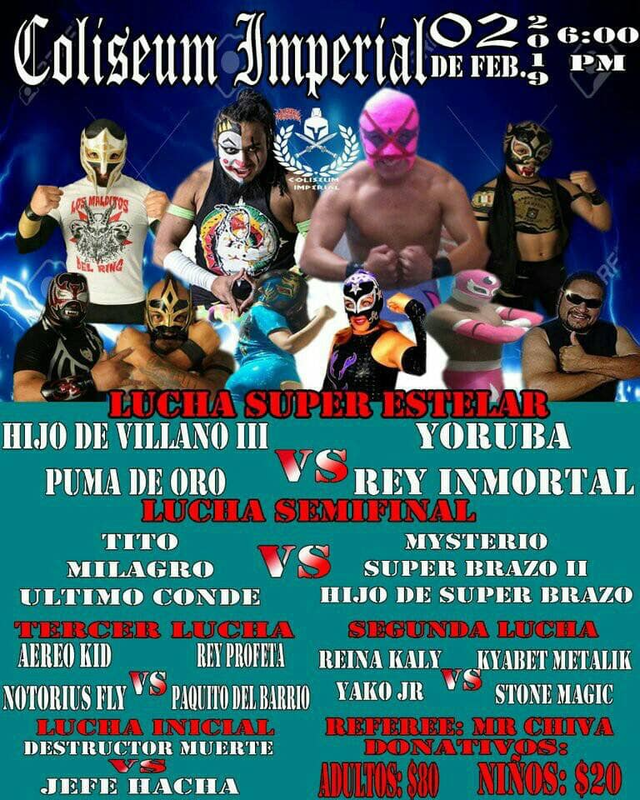 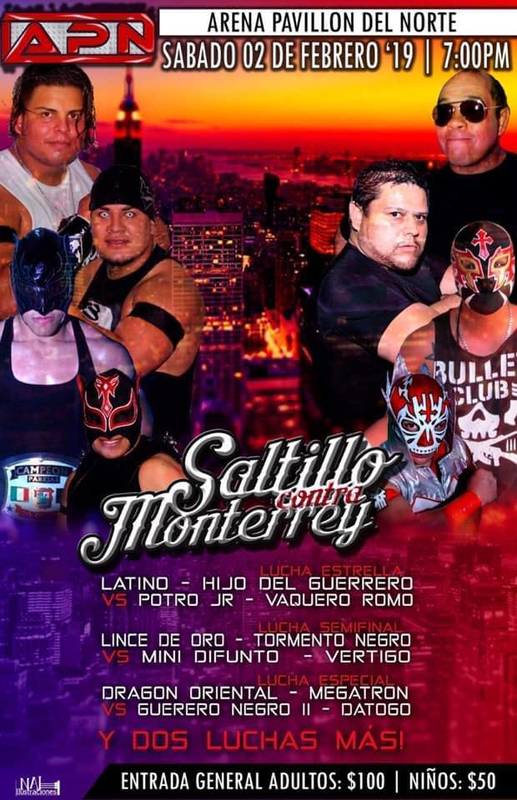 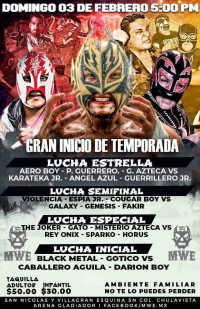 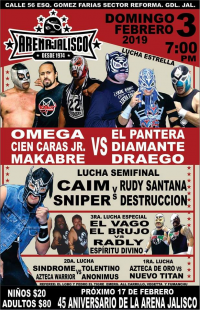 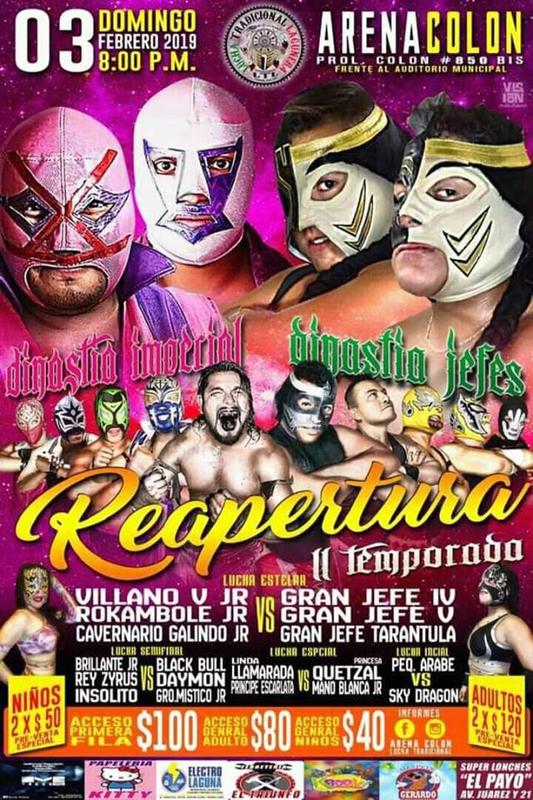 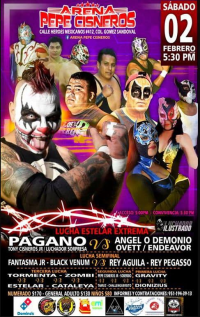 6) L.A. Park vs Blue Demon Jr., Hijo del Dr. Wagner Jr.
4) Huracán Ramírez Jr., Jack Evans, Tormenta Negra Jr. b Centella, Decnnis, Panther Boy Jr.
1) El Profeta & Jinete Sureño b Alma Suicida & Red Demon Jr.
4) Leopardo I b Hijo De Máscara Año 2000. 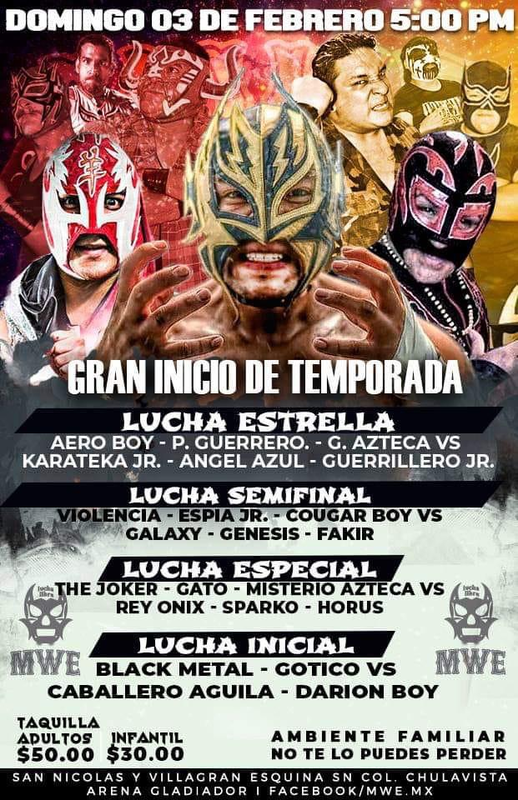 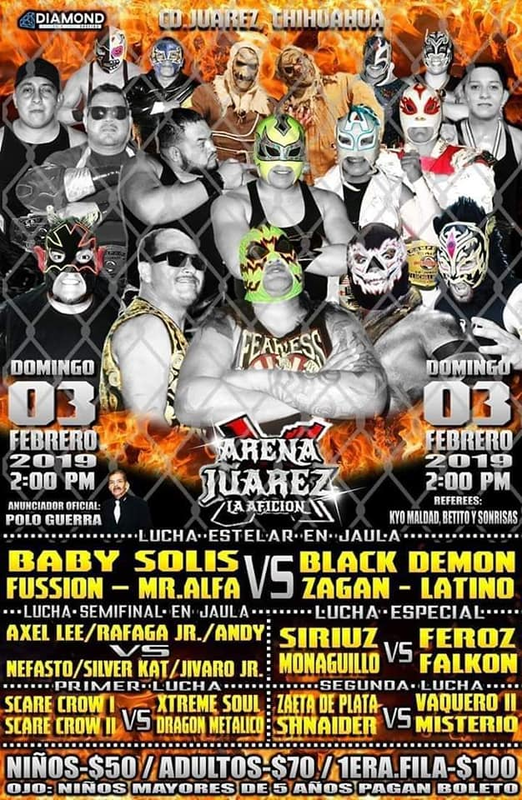 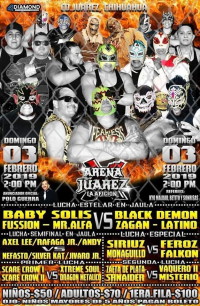 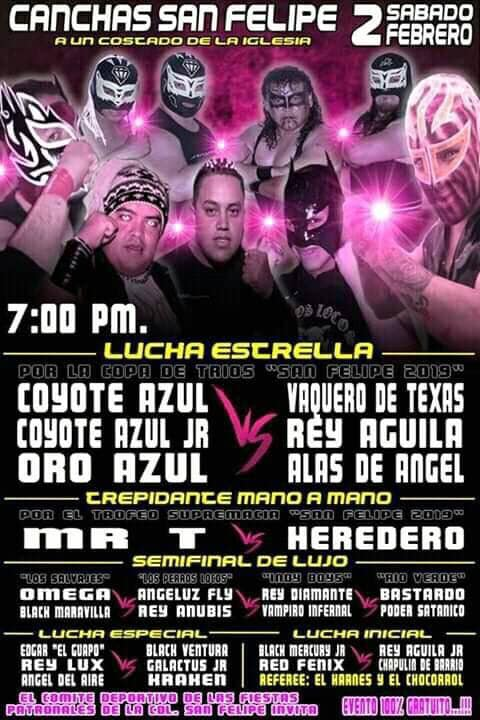 5) Lalo El Loco b Caballero Templario, Canek Jr.
1) Blue Tigger & Sombrita vs Malquerida & Metalero Jr.
No Fly Warrior so this became a three way. 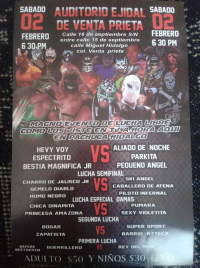 good match. 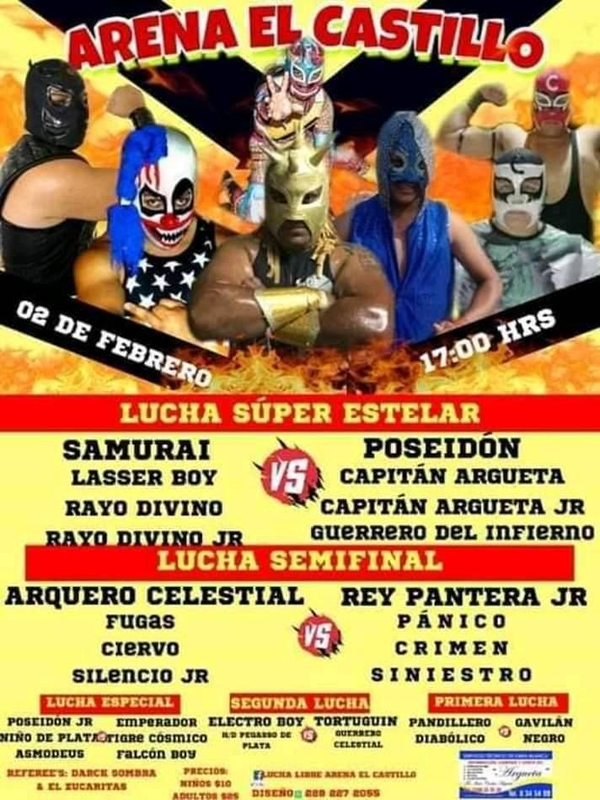 Metaleon replaced Alas de Oro. Satanico & Garica won, then teased a hair match. 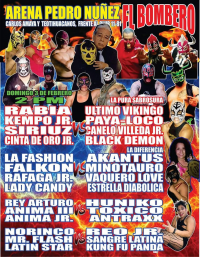 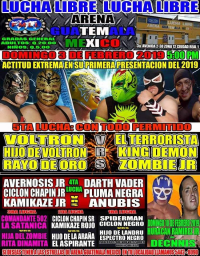 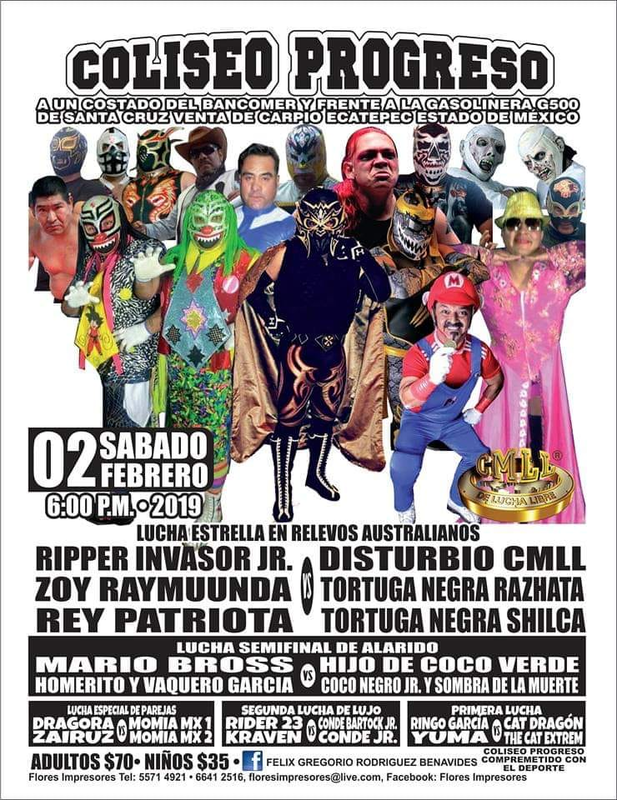 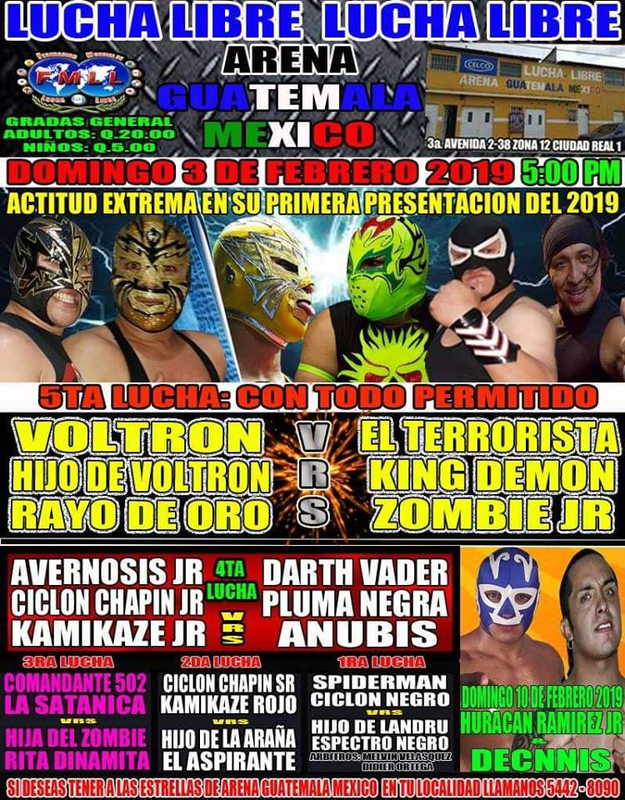 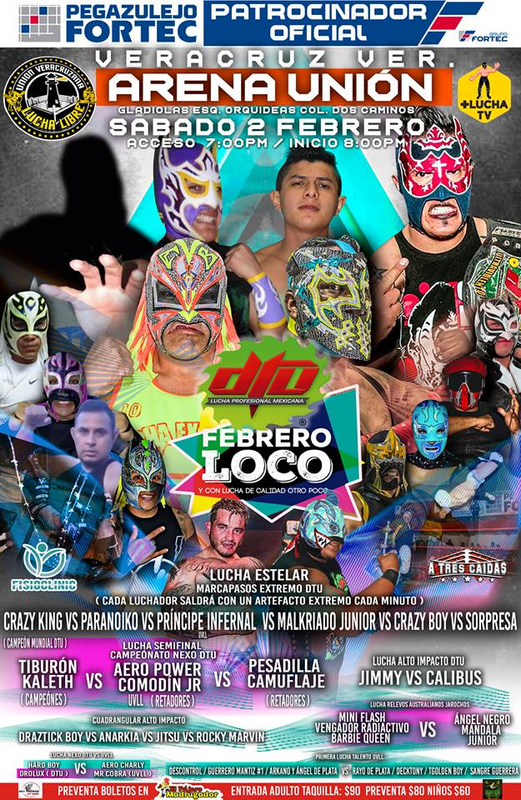 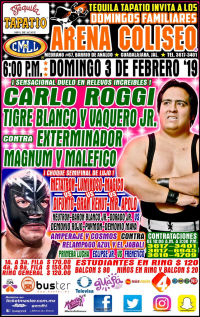 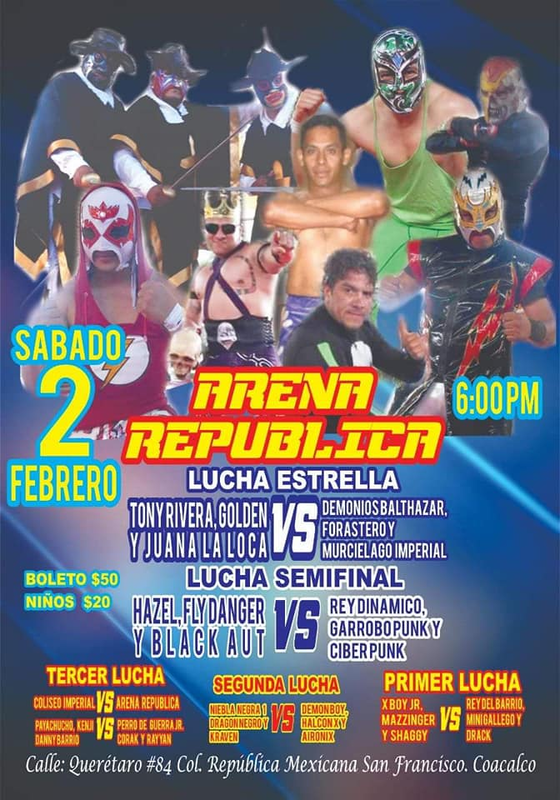 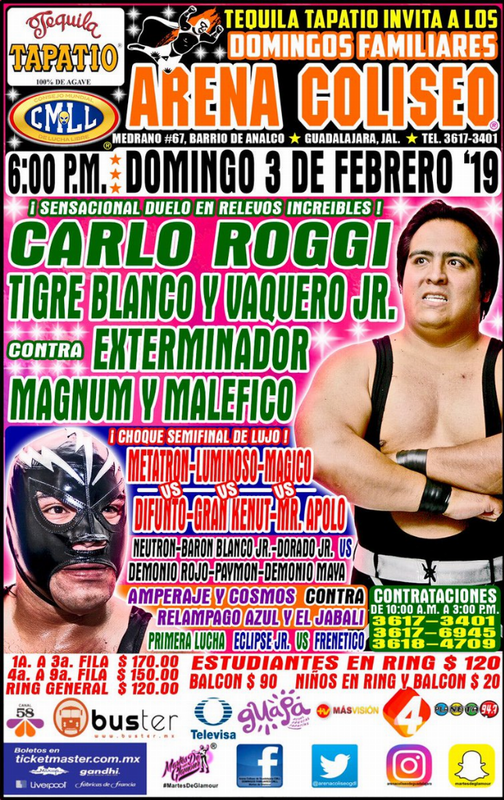 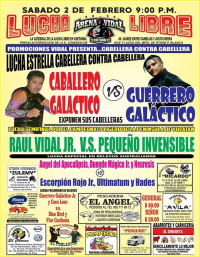 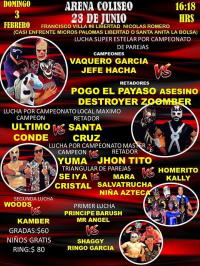 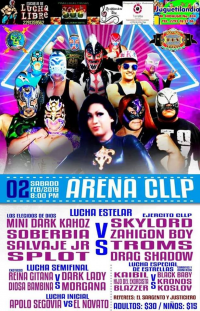 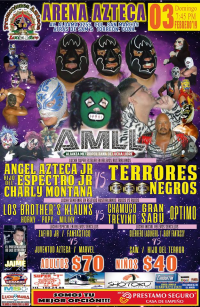 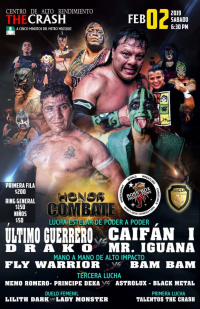 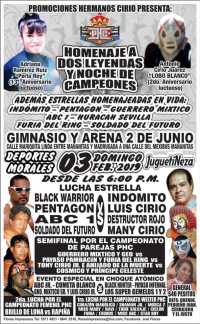 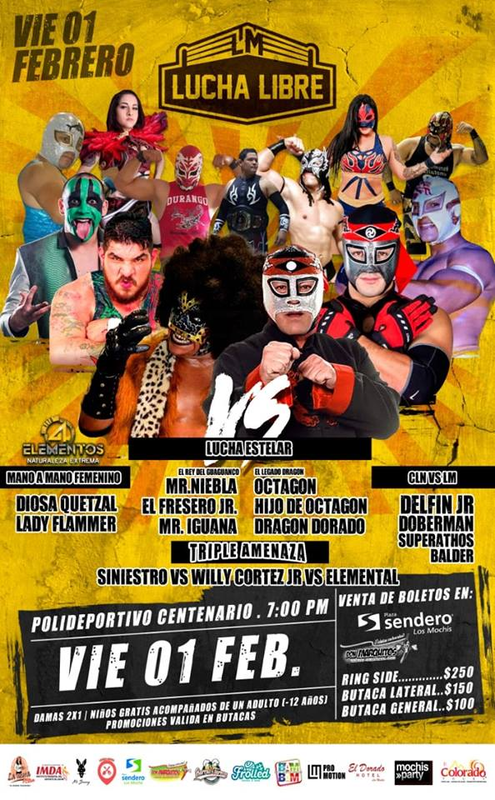 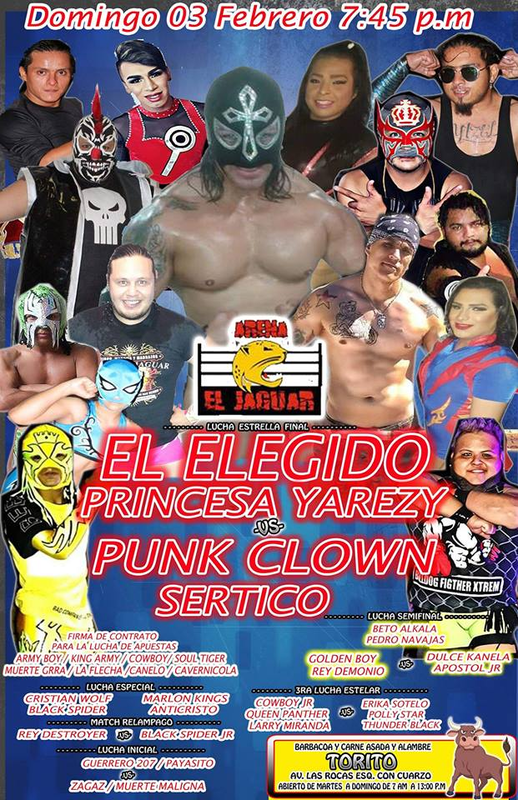 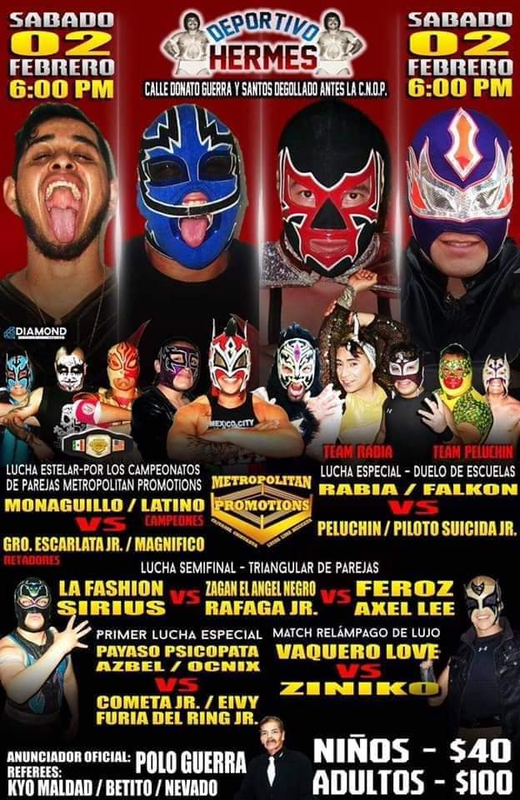 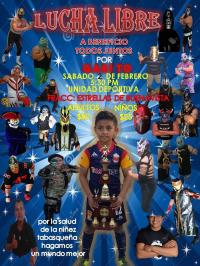 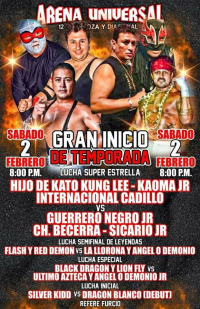 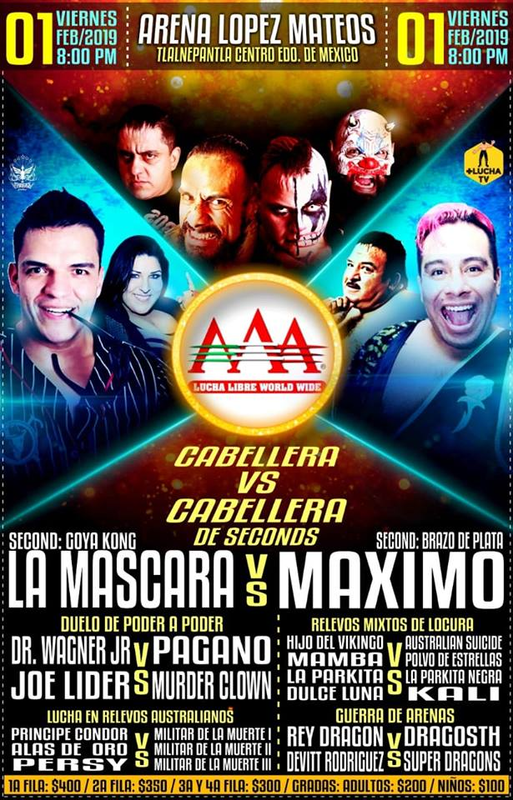 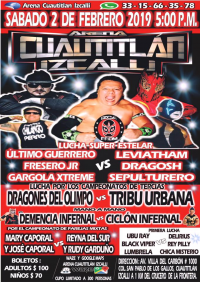 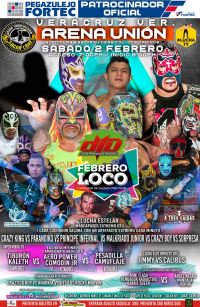 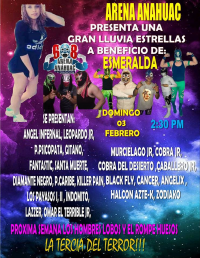 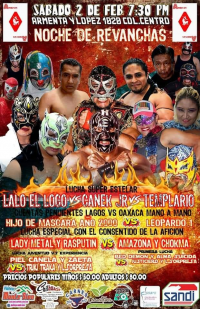 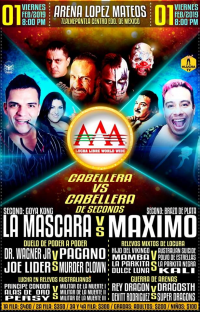 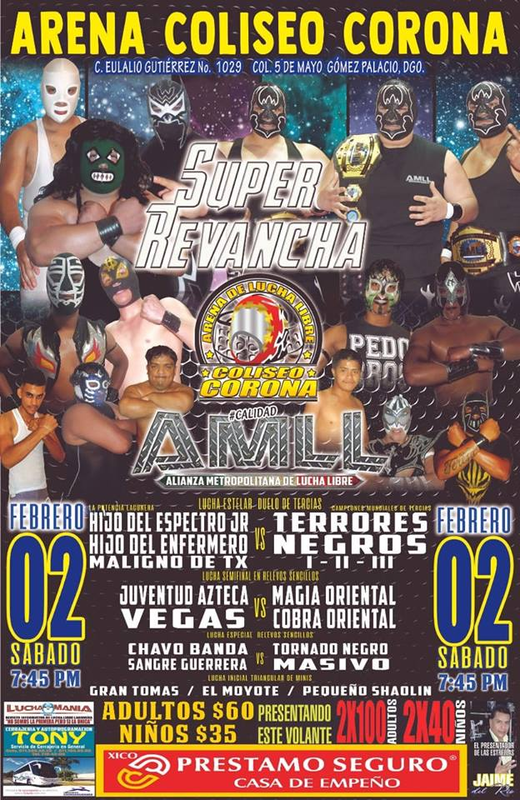 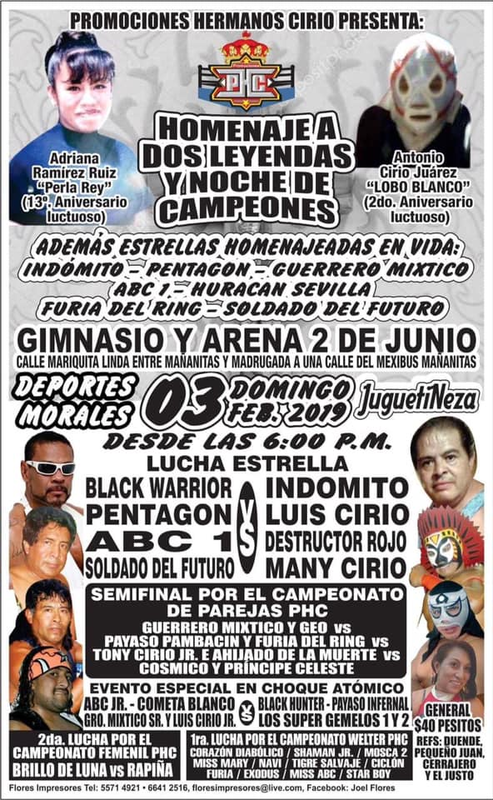 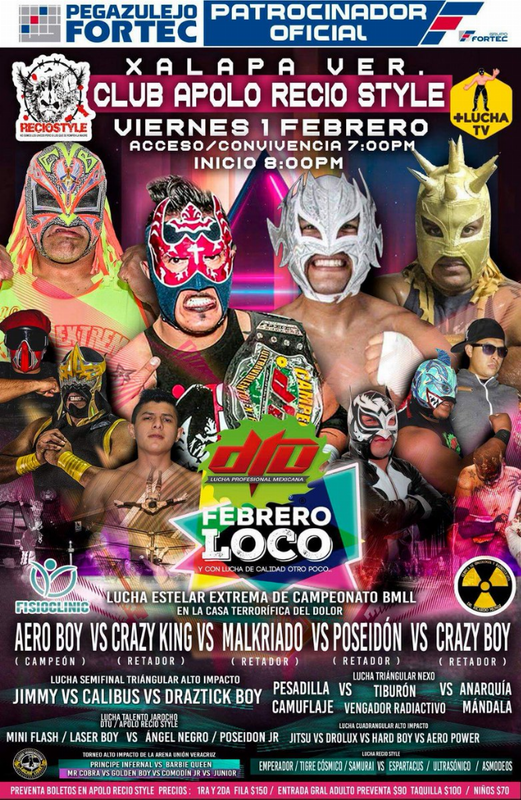 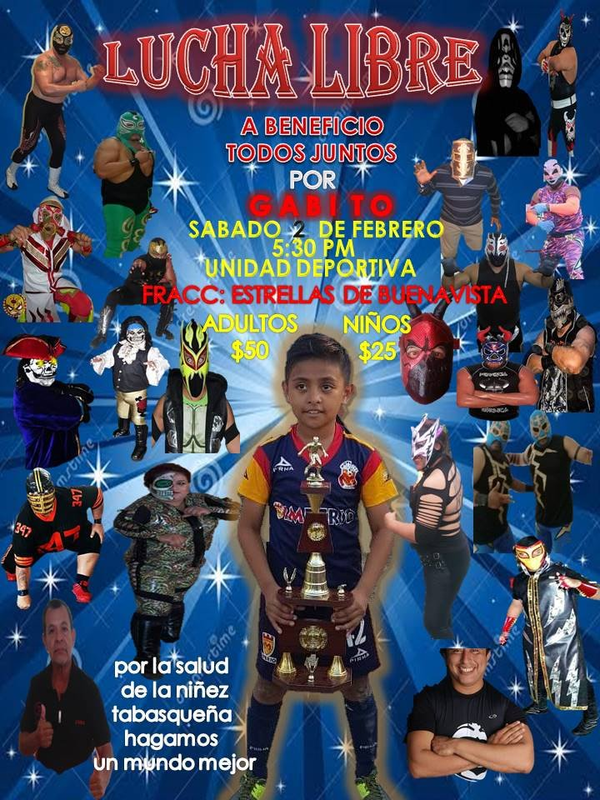 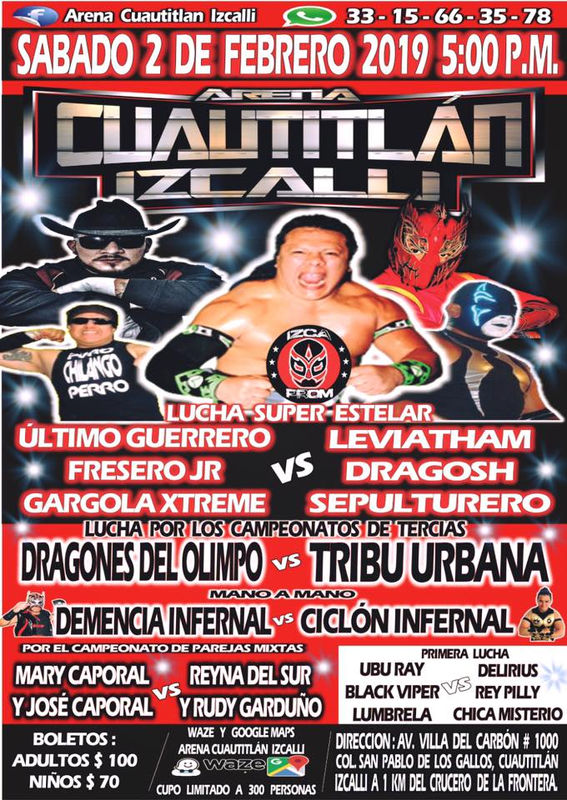 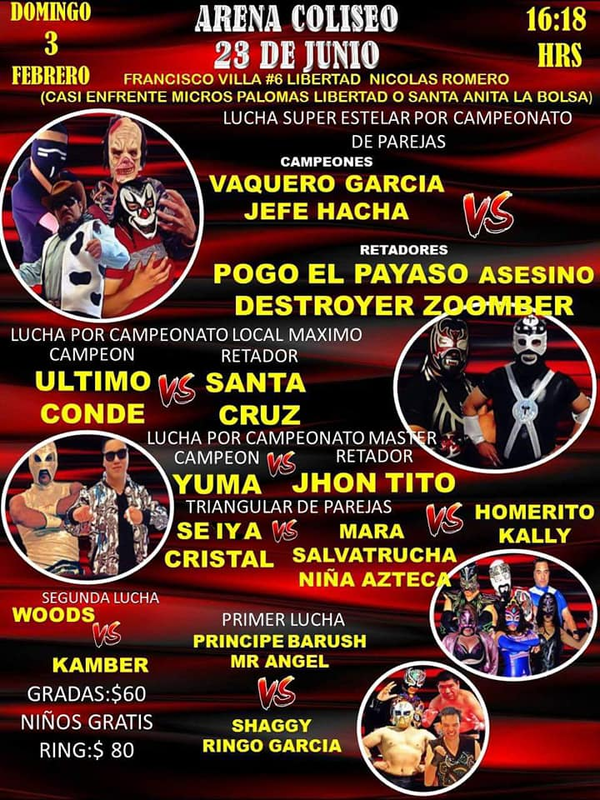 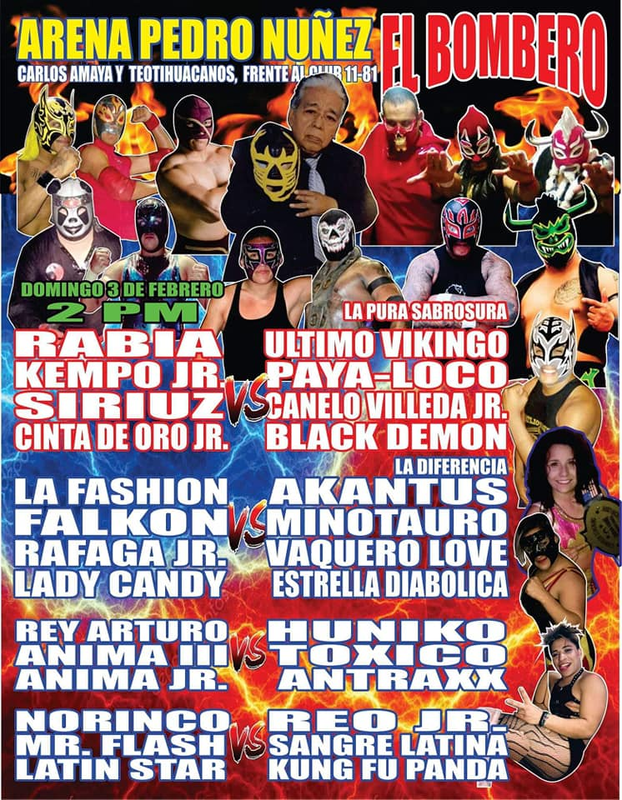 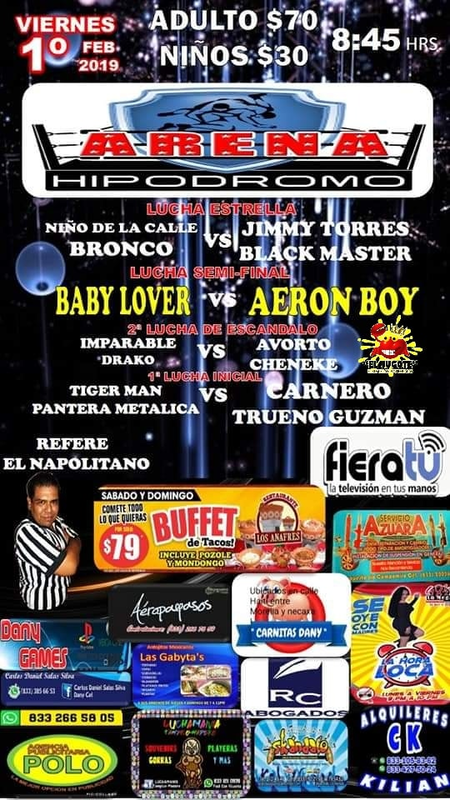 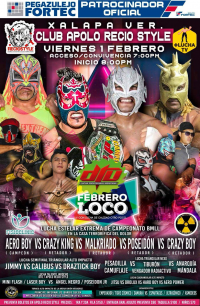 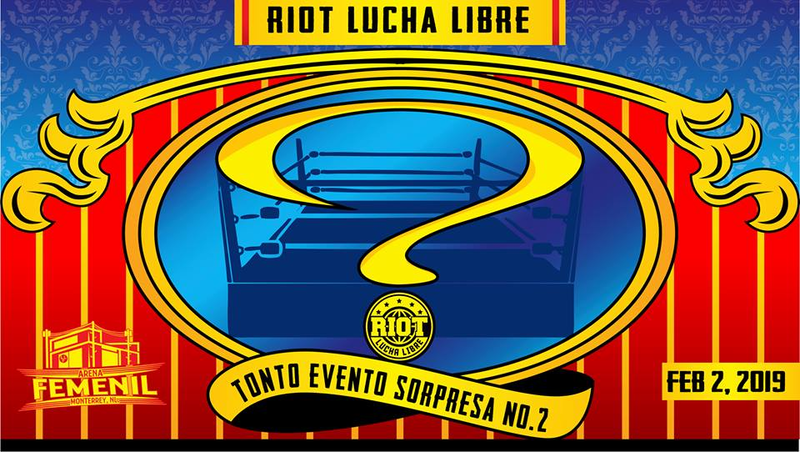 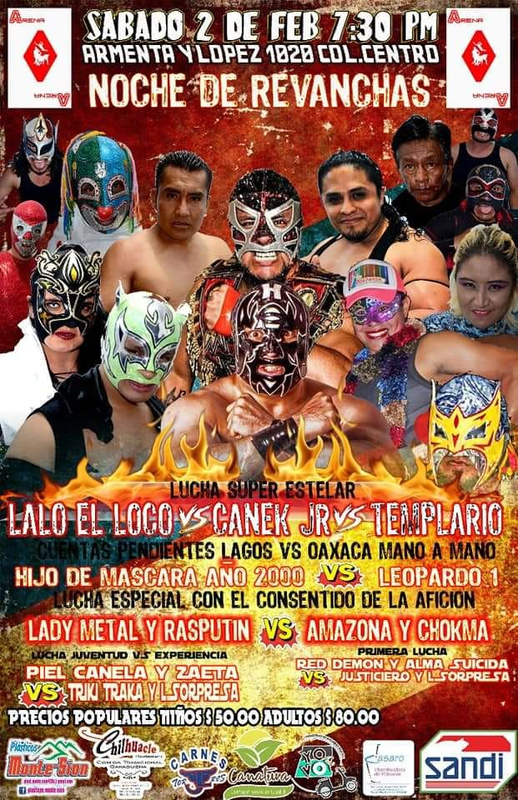 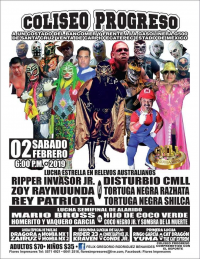 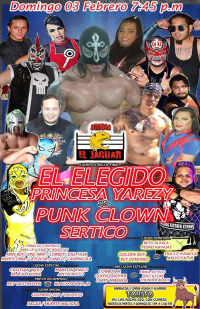 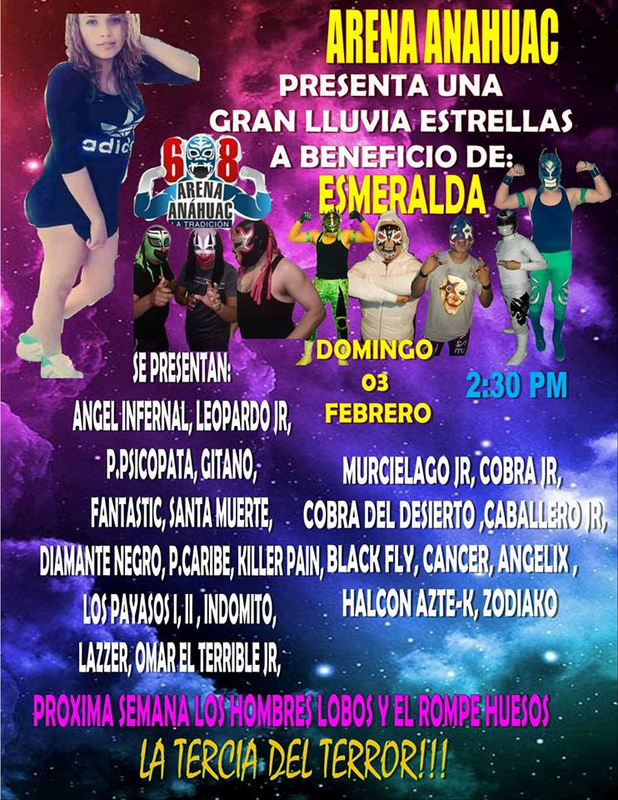 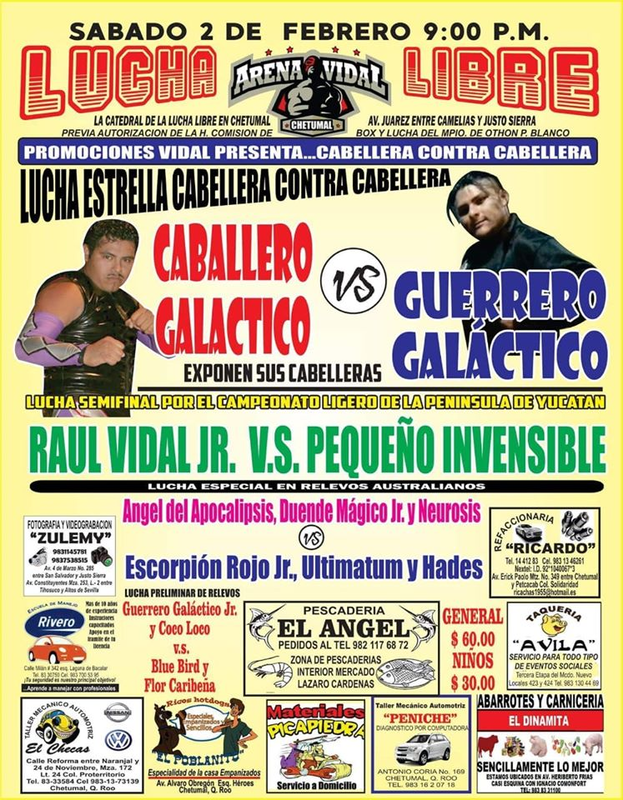 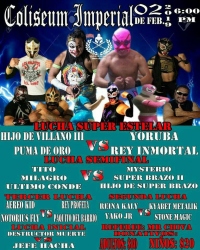 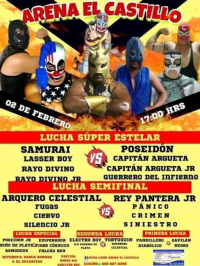 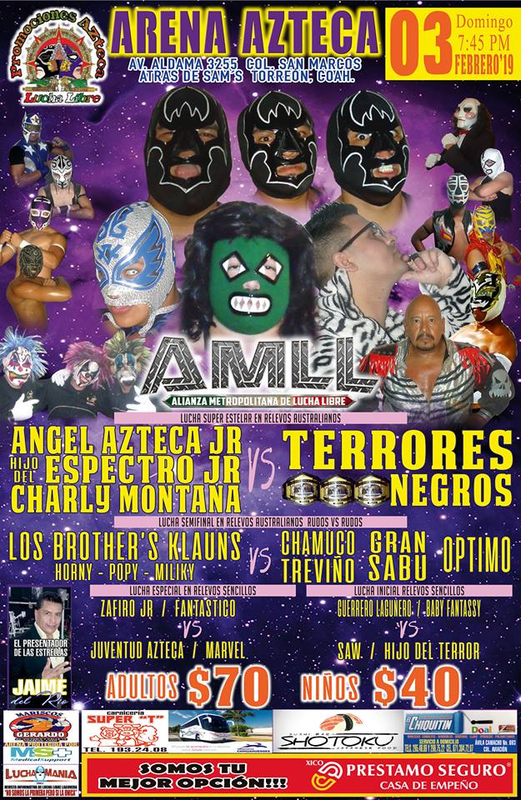 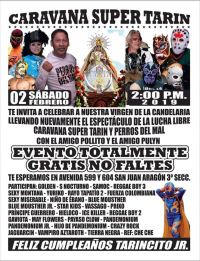 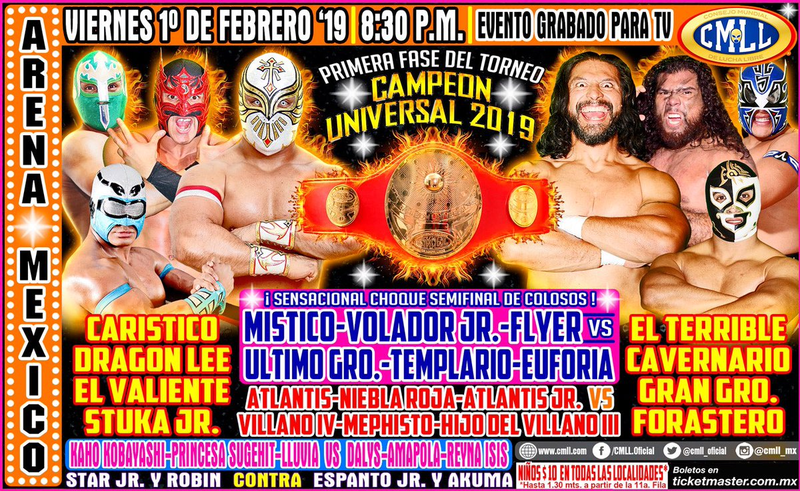 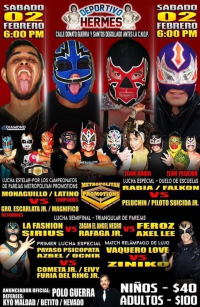 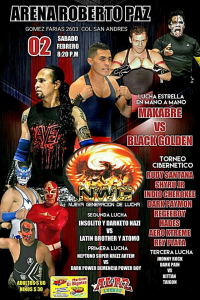 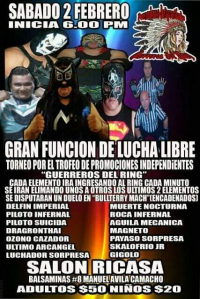 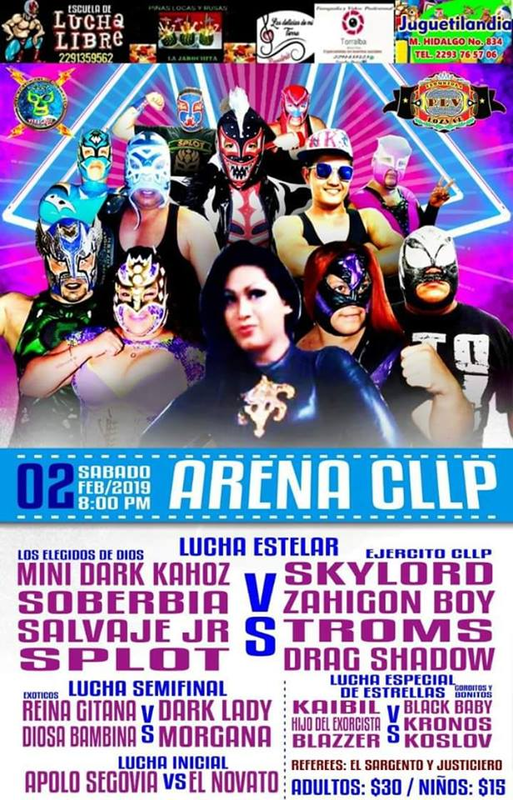 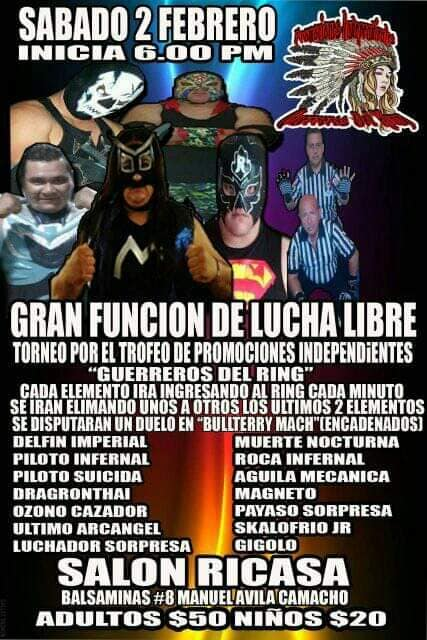 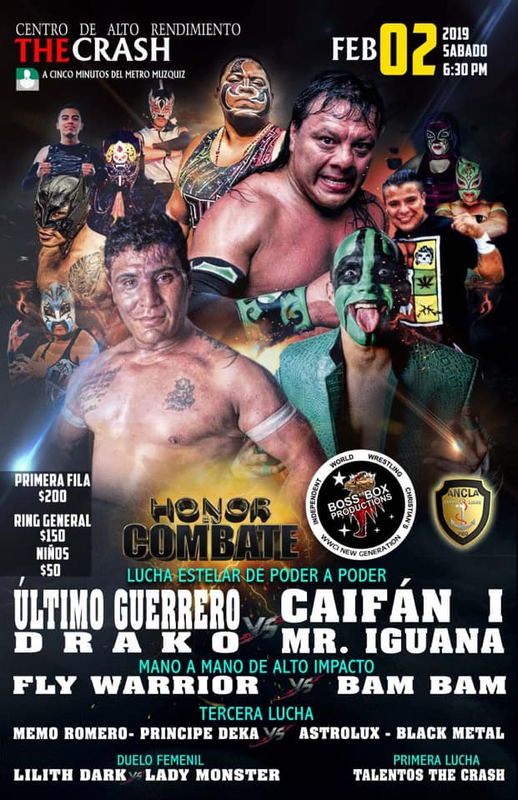 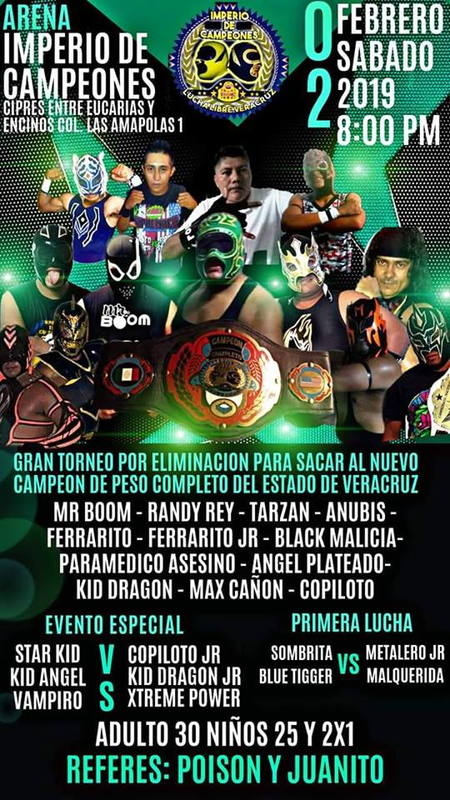 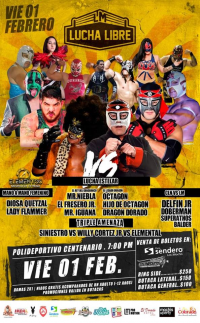 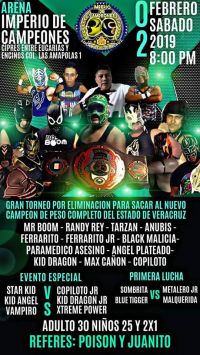 1) Blue Bird & Flor Caribeña vs Coco Loco & Guerrero Galáctico Jr.
1) Macknum & Rey Tornado b Bullizon & Rey Tornado Jr.
1) Black Mercury Jr. & Red Fénix vs Chapulín De Barrio & Rey Águilar Jr.
2) Kraven & Rider 23 vs Conde Bartock Jr. & Conde Jr.
2) Azbel, Óxnic, Payaso Psicópata vs Cometa Jr., Eivy, Furia Del Ring Jr.
4) Falkon & Rabia vs Peluchin & Piloto Suicida Jr.
1) Ángel Obscuro & Pajaro b Antrax & Maxisol Jr.
5) Blue Demon Jr. DQ LA Park, Hijo del Dr. Wagner Jr.
1) Frenético b Eclipse Jr.
3) Brillante Jr., Insolio, Rey Zyrus vs Black Bull, Daymon, Guerrero Mistico Jr.